Looking for a healthier alternative to soda’s, sugar sweetened drinks, vitamin water, and drinks with artificial colors and flavors? Below are some pretty simple infusions that you can do and what they are good for! 1. Green tea, mint, lime – fat burning, digestion, headaches, congestion and breath freshener. 2. 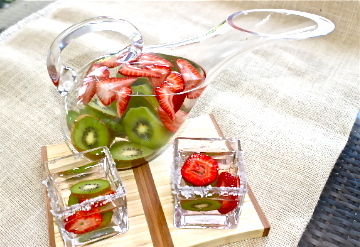 Strawberry, kiwi – cardiovascular health, immune system protection, blood sugar regulation, digestion. So now what is an infusion and how do you go about doing this? Take these fruits and cut them into nice slivers. Put them in nice tall glass mason jars or any container that you have that is large enough for a lot of water and a lot of fruit (glass if you want to add essential oils to them), and let them sit for 30 minutes. An infusion is letting the plant or fruit steep in a solvent (in this case water) in order for the fruit/herbs to release their phytochemicals, minerals, taste, and chemical compounds. For fruit, it is better to do this without heat, because heat will destroy some of the volatile chemical constituents which are therapeutic. It is very refreshing if you have this in the fridge and pour yourself some in the morning. Lemon or Lime (same properties, slightly different flavors) – Great for detoxification and flushing out the system. Wonderful for kidney health. *Cinnamon – Another blood sugar regulator (perfect if you want to add it to the strawberry kiwi) and extremely effective antibacterial and antiviral. Ginger – One of my new favorites! Great for digestion, and nice bitter taste to it. Helps clear sinuses, aids in nausea, helps with joint pain and cramping. Grapefruit – Helps curb your appetite, mood lifter, and helps increase metabolism. Great addition to the cucumber, lemon, lime infusion. Peppermint – Need that pick me up in order to get you nice and awake? Peppermint is a great stimulant and wonderful cognitive essential oil that helps improve concentration. Will also leave you with fresh breath, and helps with breathing. This entry was posted in Recipes and tagged essential oils, fresh fruit, healthier alternatives, infusion, natural living.